Margaret the First dramatizes the life of Margaret Cavendish, the shy, gifted, and wildly unconventional 17th-century Duchess. The eccentric Margaret wrote and published volumes of poems, philosophy, feminist plays, and utopian science fiction at a time when "being a writer" was not an option open to women. As one of the Queen's attendants and the daughter of prominent Royalists, she was exiled to France when King Charles I was overthrown. As the English Civil War raged on, Margaret met and married William Cavendish, who encouraged her writing and her desire for a career. After the War, her work earned her both fame and infamy in England: at the dawn of daily newspapers, she was "Mad Madge," an original tabloid celebrity. Yet Margaret was also the first woman to be invited to the Royal Society of London--a mainstay of the Scientific Revolution--and the last for another two hundred years. 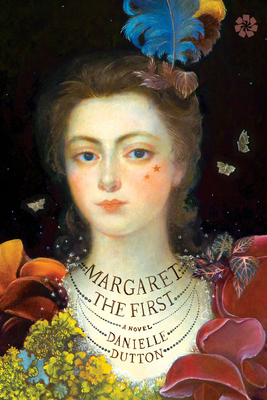 Margaret the First is very much a contemporary novel set in the past. Written with lucid precision and sharp cuts through narrative time, it is a gorgeous and wholly new approach to imagining the life of a historical woman. Danielle Dutton's fiction has appeared in magazines such as Harper's, BOMB, Fence, and Noon. She is the author of a collection of hybrid prose pieces, Attempts at a Life, which Daniel Handler in Entertainment Weekly called "indescribably beautiful," and an experimental novel, S P R A W L, a finalist for the Believer Book Award. In 2015, she wrote the texts for Here Comes Kitty: A Comic Opera, an artists' book with collages by Richard Kraft. Dutton holds a PhD in Literature and Writing from the University of Denver, an MFA from The School of the Art Institute of Chicago, and a BA in History from the University of California at Santa Cruz. Prior to her current position on the creative writing faculty at Washington University in St. Louis, she taught in the Jack Kerouac School of Disembodied Poetics at Naropa and was the book designer at Dalkey Archive Press. In 2010, Dutton founded the small press Dorothy, a publishing project, named for her great aunt Dorothy Traver, a librarian who drove a bookmobile through the back hills of southern California. Now in its fifth year, the press's books are widely reviewed. The press itself has been praised in the New York Times and Chicago Tribune, and Dutton has been interviewed in the Paris Review, Kirkus, and elsewhere for her work promoting innovative women writers.